A black leather sofa would compliment and increase the luxury of your living environment but many people think that black leather sofas are very expensive and often out of their price range. However RJF Furnishings offer cheap black leather sofas at prices that you can afford. They are offered at up to 70% off the RRP so we won’t be beaten on price. 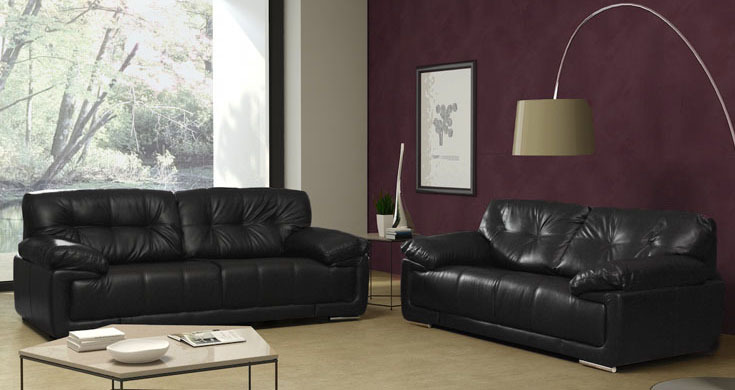 Also the quality of our black leather sofas is exceptional. Also available in Brown leather! Take for example the Azki 3 and 2 seater black leather sofa that we have available. A stunning example of a quality black leather sofa at an unbeatable price. It is stylish and modern and would look fantastic in your living room; in fact it would be the focal point of any room. This black leather sofa is comfortable to sit on because it is covered in deep grain, premium bonded leather. The seats are pocket sprung for extra comfort and the detailing on the cushions is exquisite. The Azki looks a lot more expensive than it actually is and you won’t find a similar one for the price on the High Street. There is bonded leather on all wearing parts of the sofa and a leather match on non-facing panels. This makes the Azki durable and it is so easy to wipe clean, allowing your sofa to look like new for years to come. For that modern feel the Azki bonded leather sofa has fixed chrome feet and the collection also comes with a footstool at an amazing price. However your sofa comes with a one year manufacturers warranty for your peace of mind. If you did want extra cover as mentioned we can arrange this for you. If the Azki interests you but you would like more information about this fantastic cheap leather sofa then simply give us a call and speak to one of our friendly representatives who will be happy to take your call. Alternatively you can chat to us online or request a call back, whichever it easiest for you.